A healthy adult makes about 2 million blood cells every second. Ninety-nine percent are oxygen-carrying red blood cells — the other one percent are platelets and various white blood cells of the immune system. How all these different kinds of blood cells derive from "hematopoietic" stem cells in our bone marrow is the subject of intense research. However, most studies focus on that one percent — immune cells. "It's a bit odd, but because red blood cells are enucleated and therefore hard to track by genetic markers, their production has been more or less ignored by the vast number of studies in the past couple of decades." Camilla Forsberg PhD, Professor, Biomolecular Engineering, Baskin School of Engineering, University of California Santa Cruz, USA. In a new study, published March 21 in Stem Cell Reports, Forsberg's lab overcame technical obstacles and put together a thorough accounting of blood cells from hematopoietic stem cells. Important research for understanding diseases such as anemia, and blood cancers such as leukemias and lymphomas. "We're trying to understand the balance of production of blood cells and immune cells, which goes wrong in many kinds of disorders," explains Forsberg. How hematopoietic stem cells give rise to mature blood cells involves knowing how multiple progenitor cells progressively commit to a specific fate as cells mature. A major decision is whether to become lymphoid progenitor cells, that give rise to white blood cells called lymphocytes, or myeloid progenitor cells, that give rise to other kinds of white blood cells, red blood cells and platelets. The majority of cells in bone marrow are myeloid. Quantitative analyses of mature hematopoietic stem cells (HSCs) and multiple hematopoietic progenitor populations — by the absolute numbers of mature cell types produced by each progenitor cell, reveals a striking erythroid dominance. This new insight prompts an erythroid-focused model of differentiation. The new study found all progenitor cells with myeloid potential produce far more red blood cells than any other cell type. Surprising, as in many previous studies progenitor cells grown in cell cultures ("in vitro") had limited capacity to produce red blood cells and platelets. Forsberg believes those results were an artifact of culturing conditions. "It's been hard to make sense of a lot of those [previous] experiments, because we know our bodies need to make a lot of red blood cells and platelets. 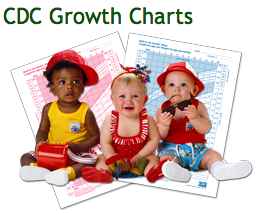 Our results show that these progenitor cells retain a lot of red blood cell potential. In fact, we propose that red blood cell production is the default [hematopoietic stem cell] pathway." In experiments led by first author Scott Boyer (graduate student), researchers transplanted different progenitor cell populations into mice in order to track production of red blood cells, platelets (the second largest blood cell type) and immune cells. Boyer also transplanted single progenitor cells — and then identified the blood and immune cells produced by those single cells. By quantifying the numbers of mature blood cells produced from these transplanted progenitor cells, the team confirmed that red blood cells are by far the most abundant cell type produced by every type of progenitor cell, with the exception of lymphoid progenitor cells. These findings led to a model of hematopoietic differentiation focused on red blood cells as the default pathway for all myeloid progenitor cells. • Erythroid cell production emerges as a default hematopoietic fate. 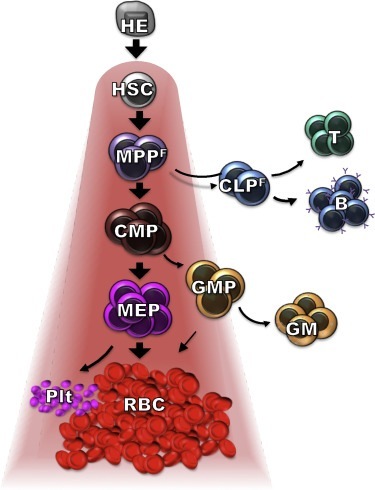 Hematopoiesis is arguably one of the best understood stem cell systems; however, significant challenges remain to reach a consensus understanding of the lineage potential, heterogeneity, and relationships of hematopoietic stem and progenitor cell populations. To gain new insights, we performed quantitative analyses of mature cell production from hematopoietic stem cells (HSCs) and multiple hematopoietic progenitor populations. Assessment of the absolute numbers of mature cell types produced by each progenitor cell revealed a striking erythroid dominance of all myeloid-competent progenitors assessed, accompanied by strong platelet reconstitution. All populations with myeloid potential also produced robust numbers of red blood cells and platelets in vivo. Clonal analysis by single-cell transplantation and by spleen colony assays revealed that a significant fraction of HSCs and multipotent progenitors have multilineage potential at the single-cell level. 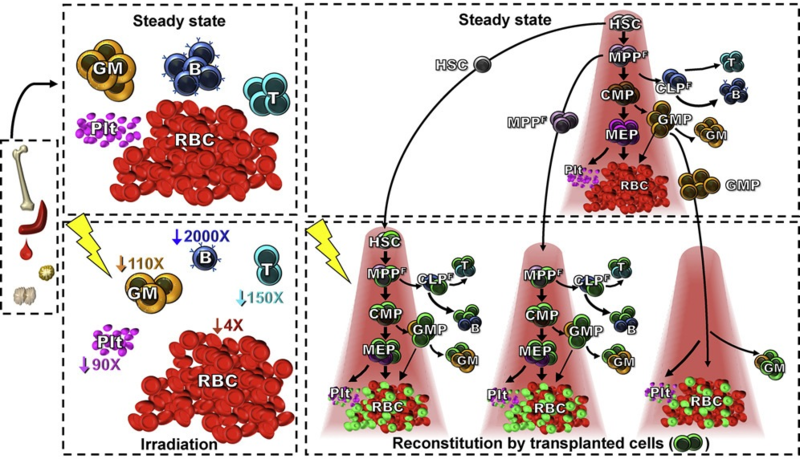 These new insights prompt an erythroid-focused model of hematopoietic differentiation. Scott W. Boyer, Smrithi Rajendiran, Anna E. Beaudin, Stephanie Smith-Berdan. Praveen K. Muthuswamy, Jessica Perez-Cunningham, Eric W. Martin, Christa Cheung, Herman Tsang, Mark Landon and E. Camilla Forsberg. The authors thank Forsberg lab members for comments on the manuscript. 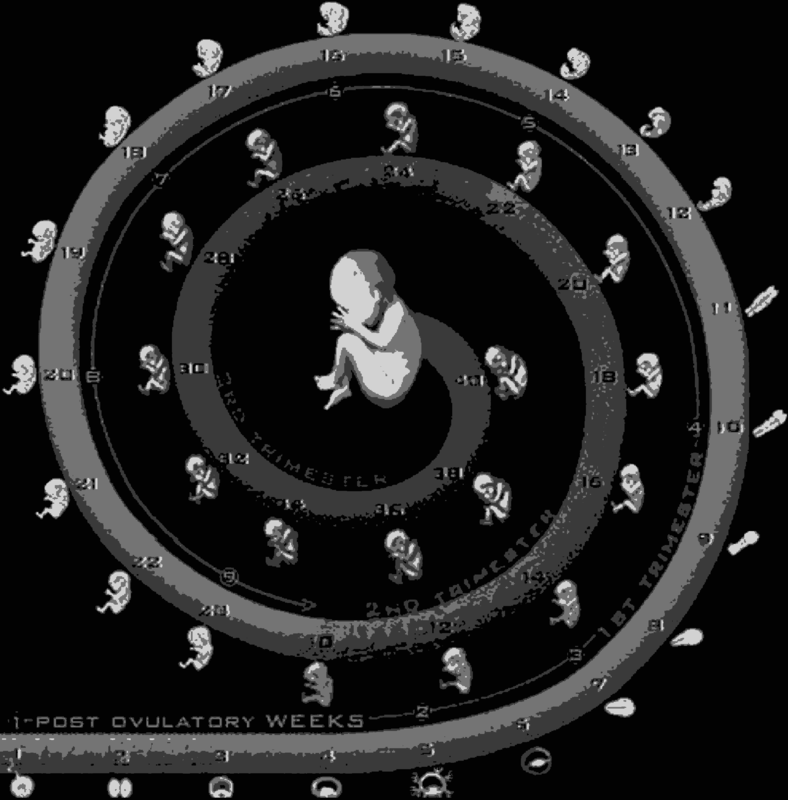 This work was supported by an NIH/NHLBI award (R01HL115158) to E.C.F. ; by CIRM training grant TG2-01157 to S.W.B. and A.E.B. ; by NIH/NIGMS T32-GM008646 to S.W.B. and J.P.C. ; by an HHMI Gilliam pre-doctoral award to J.P.C. ; by CIRM SCILL grant TB1-01195 to E.W.M. via San Jose State University; and by CIRM Shared Stem Cell Facilities (CL1-00506) and CIRM Major Facilities (FA1-00617-1) awards to the University of California, Santa Cruz. represents the default fate of HSCs. Image: Forsberg lab.